In response to the idea that static representation might “capture” or “halt” the eventfulness of life, Lovejoy invites the reader to consider move-ability in the doings of images and texts. Here reductive re-presentation is refused calling on our sense-abilities to see—that is perceive things in their real contexts. A focus on context is a focus on what happens rather than on a thing that is in the world. Loitering with intent in a series of vignettes she invites you to “vade mecum … go with me” as she revisits past projects in an attempt to re-present experiential complexities of practice through narrative c/artographies. Guest, A. (2009). Artists and places—The time for a new relationship and a new agenda. Retrieved from http://archive.publicartscotland.com/features/11-ARTISTS-AND-PLACES-the-time-for-a-new-relationship-and-a-new-agenda. Johnson, S. (2010). The glass box and the commonplace book. Transcript of the Hearst New Media lecture at Columbia University. Retrieved from http://www.stevenberlinjohnson.com/2010/04/the-glass-box-and-the-commonplace-book.html. Koh, J. (2010). 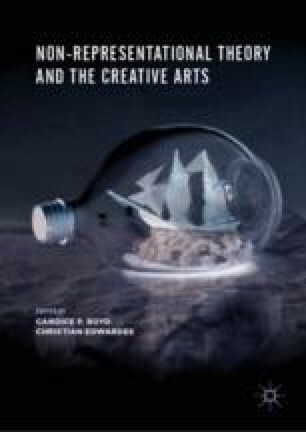 Artist’s research text on methodology. Helsinki, UK: The Finnish Academy of Fine Arts. Retrieved from http://www.ifima.net/ifima/personal/jaybio.htm.